Mississippi Aquarium's education mission is to create a love and understanding of coastal ecology so that negative impacts on this fragile environment can be reduced. When you visit us, you’ll learn about the beauty of both local and exotic species and how healthy animals thrive in healthy environments. One of the primary threats to ecosystems around the world is invasive species, and Mississippi has to fight these invaders from land, sea and sky. An invasive species is any type of living organism, from bacteria to mammals, that is not native to a particular ecosystem or geographic region and causes harm when it is introduced. A healthy ecosystem is balanced. All the species that reside in a healthy ecosystem co-exist due to long-term natural selection and checks-and-balances between predators and prey. When a non-native species is introduced into one of these balanced systems under the right conditions it can reproduce quickly and spread aggressively. This can result in an ecosystem crash where native species cannot compete and the invasive species can dominate. Invasive species are considered a leading threat to biodiversity worldwide and cost billions of dollars in agricultural and forestry losses. Mississippi is a state full of rich biodiversity, unique ecosystems and large tracts of rural areas not found anywhere else in the country. Unfortunately it is also home to invasive species that wage war with our native flora and fauna. Invasive species have been introduced into habitats in a variety of ways, but many of them were purposefully introduced as a form of biological control. For example, Asian carp and the kudzu vine were both introduced as a solution to an environmental issue or concern. Asian carp were initially used to help control weeds and parasites in aquaculture operations but then spread into rivers. Now in the Mississippi River, the fish are quickly moving northward outcompeting native species for food and habitat. Kudzu was distributed by the US government back in the 1930’s as an erosion control. 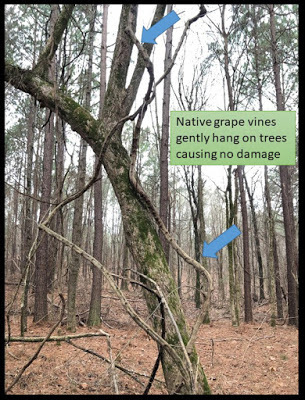 In the Southeast the vine thrived in the humid environment and took over entire ecosystems. The massive vine completely engulfs forests and hillsides growing at a rate of one foot per day during the summer! 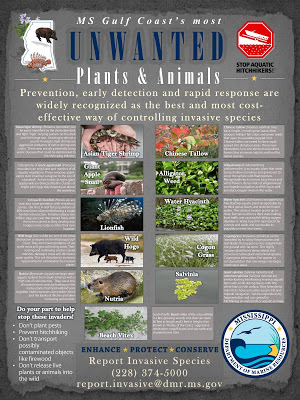 Invasive species can also be introduced accidentally through contamination of material or equipment or through release of pets or livestock into the wild. Red fire ants were accidentally introduced through the port of Mobile, Alabama around 1940 when they stowed aboard a ship arriving from South America. 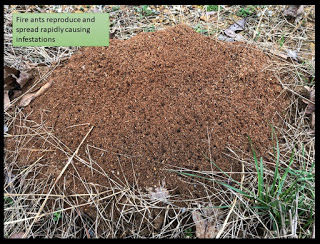 Once on land, the fast reproducing ants quickly spread all across the southeast where they displace native wildlife and kill young mammals, birds and reptiles. Pigs were first brought to Mississippi in the 1500’s by Spanish explorers where they were allowed to roam free and establish breeding groups. In the early 1900’s Eurasian boars were released into Mississippi for the purposes of sport hunting. Today’s feral pigs consist of a mix of domesticated and Eurasian boars and are one of the most destructive invasive species in Mississippi where they destroy forests, crops and livestock. The Mississippi Coastal region is particularly under siege from an ever increasing number of invasive species. The Mississippi Department of Marine Resources is working to educate the public on the threats and describe how aquatic and terrestrial invasive species arrive. Aquatic species can arrive through ballast water, hull fouling, currents and aquarium releases and terrestrial species through contaminated equipment, accidental introduction, hurricanes and pet releases. Four of the major coastal invasive species include the Chinese tallow tree, cogon grass, Asian tiger shrimp and the giant apple snail. The tallow tree has been a popular ornamental tree in the US for decades due to its ease of care, foliage and flowers. Following hurricane Katrina, the tree experienced a rapid population expansion into coastal habitats where they completely dominate entire ecosystems providing no useful food or habitat for native wildlife. Cogon grass has been called the “seventh worst weed” in the world and is a federal noxious weed. It expands rapidly, takes over grasslands and is difficult to control. The Asian tiger shrimp was first sighted in the Gulf in 2009 and now appear to be reproducing. This species eats native shrimp and shellfish, carries disease, grows fast and disrupts the reef food chain. The giant apple snail came from the pet trade when the snails were released or escaped from enclosures. Now that they are in the wild, they are highly destructive to plants, breed rapidly, host lungworm parasites, and are difficult to control. In addition to the highly visible invasive species, there are numerous invasive species that go relatively un-noticed but cause harmful long-term damage. Two of these problem plants are popular ornamental specimens brought over from Asia in the 1800's. 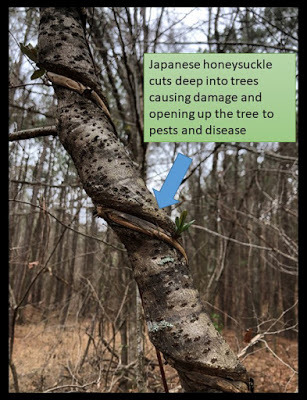 Japanese honeysuckle causes severe damage to eastern woodlands. They emerge from the forest floor, form vast colonies, displace native ground plants, climb trees and shrubs cutting off sap often resulting in tree death. The honeysuckle is also suspected of releasing a chemical that inhibits growth of other plants. Chinese privet was a popular hedge shrub in yards for decades. It reproduces rapidly and has spread to woodlands where it dominates the shrub layer. It alters ecosystem compositions, chokes out native species and shades out important herbaceous plants. It provides little use for wildlife and prevents beneficial native species from growing. Controlling invasive species is challenging and once you recognize these plants on your property, removing them can seem overwhelming. 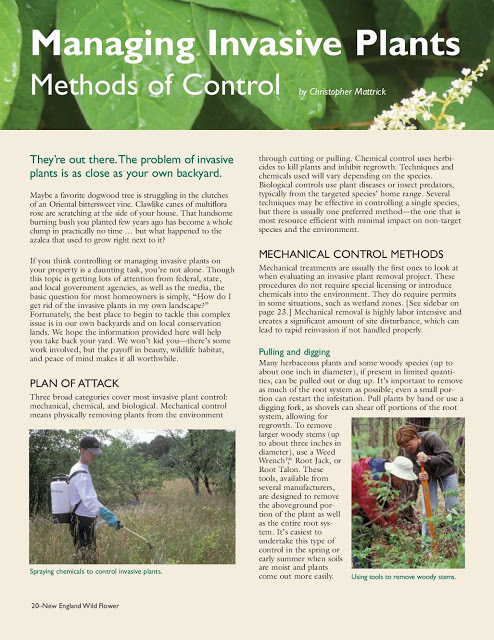 The Conservation Notes of the New England Wild Flower Society published this useful pdf for controlling invasive species. Download the full pdf here. 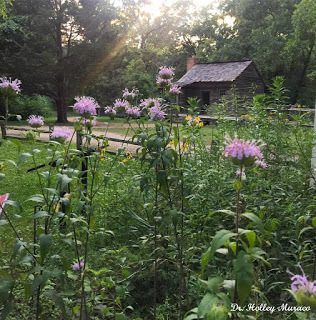 You can help counter the damage done by invasives by planting native plant species. Native plant species provides homes and food for local wildlife and helps fight habitat loss. The Mississippi Department of Marine Resources encourages you to report any invasive species that you find so they can keep track of and help control them before it becomes devastating to an ecosystem. Report invasive species by sending a photo and GPS coordinates/location information to: report.invasive@dmr.ms.gov or 228 374-5000.